If you have any comments or questions, please feel free to eithier post a comment or email me at pds30@columbia.edu - thanks! The Aziz was built in 1983 for the United Arab Emirates. 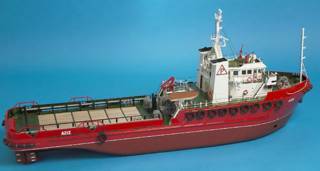 It is a fine example of an Anchor Handling Tug / Supply Vessel used for offshore oil drilling. The model is over 43 inches long (over 3 1/2 feet) and will be driven in the boat pond in Central Park, hopefully by this summer. The above picture shows what the model should look like when completed. 3/18/05 - I must say that there are two great decisions I made in making this model. First was buying a kit from Model Slipway - the quality is fantastic and anytime I have had any difficutly (due to my inexperience) all I had to do was pick up the phone to get advise from the folks there. My second great decision was to buy the kit from Gold Coast Hobby in Glen Head. When you buy a model from them you are buying not only the model but help and guidance from Charlie, the owner and a very experienced model maker. Here too, all I had to do was pick up the phone and call. I'll mail you, but I thought I'd post here too. Heh! I've been using your blog as a supplemental guide to building Aziz to complement the Model Slipway instructions. I'm about 3/4 through building mine now, and although I've had issues with painting too I'm glad to say my airbrush is behaving itself! Well done on an extremely useful and informative blog. I found it too late to blog my build, but may do something similar for my next build: Model Slipway 'Gry Maritha'. Hi paul s, I found your blog informative. While out blog surfing today for specific info on wood working clamps, I ended up on your page. Your THE DREAM shows that I ended up a little off base, but I am certainly glad I stopped by. I will bookmark your site for a future visit, and should you ever need it, there is plenty of information on this site about wood working clamps. bookmark your site for future reference and reading. Should you ever need it, you can get specific information about pattern santas wood working at the site above. stopped by. Oh well, back to surfing and I am sure I will find what I am looking for, and should you ever need information about pattern santas wood working, then stop by for a look. Thanks for the post. stopped by. Oh well, back to surfing and I am sure I will find what I am looking for, and should you ever need information about wood working clamps, then stop by for a look. Thanks for the post. Hi there paul s, a real useful blog. Can you believe it? When blog surfing for detailed info on wood working bed plan I ended up on your page. Obviously THE DREAM is not exactly what I was searching for, but your site caught my interest. Just wanted to drop a quick note to comment your blog...now to move on and continue my search for wood working bed plan. Should the need ever arise where you need information on wood working bed plan then drop by for a look. stopped by. Oh well, back to surfing and I am sure I will find what I am looking for, and should you ever need information about gun cabinet wood working plan, then stop by for a look. Thanks for the post. information on gun cabinet wood working plan then drop by the site above and check it out. Hi paul s...Wow! While I was searching for info on dewalt wood working tool I somehow found your page. Obviously I ended up a little off base, but I am certainly glad I stopped by for a read. While I am here, I just wanted to drop a quick note to comment your blog...now to move on and continue my search for dewalt wood working tool. Should you ever need it, there's lots of information on this site about #KEYWORD##. Thanks for creating this site! I am a water garden enthusiast as well. I enjoy surfing the Web and finding sites that are related to water gardening that I can tell my newsletter about. I will be sure and bookmark your site. I enjoyed you blog about atenolol indigestion. I also have a site about atenolol indigestion which makes me appreciate this one even more! Keep up the good work! stopped by. Oh well, back to surfing and I am sure I will find what I am looking for, and should you ever need information about rocking horse in uk wood working, then stop by for a look. Thanks for the post. Hi paul s...Wow! While I was searching for info on wood working band saw I somehow found your page. Obviously I ended up a little off base, but I am certainly glad I stopped by for a read. While I am here, I just wanted to drop a quick note to comment your blog...now to move on and continue my search for wood working band saw. Should you ever need it, there's lots of information on this site about #KEYWORD##. information on wood working bed plan then drop by the site above and check it out. stopped by. Oh well, back to surfing and I am sure I will find what I am looking for, and should you ever need information about wood working band saw, then stop by for a look. Thanks for the post. stopped by. Oh well, back to surfing and I am sure I will find what I am looking for, and should you ever need information about wood working bed plan, then stop by for a look. Thanks for the post. Hi there paul s, a real useful blog. Can you believe it? When blog surfing for detailed info on wood working band saw I ended up on your page. Obviously THE DREAM is not exactly what I was searching for, but your site caught my interest. Just wanted to drop a quick note to comment your blog...now to move on and continue my search for wood working band saw. Should the need ever arise where you need information on wood working band saw then drop by for a look. bookmark your site for future reference and reading. Should you ever need it, you can get specific information about wood working technique at the site above. Hi paul s, I found your blog informative. While out blog surfing today for specific info on wood working bed plan, I ended up on your page. Your THE DREAM shows that I ended up a little off base, but I am certainly glad I stopped by. I will bookmark your site for a future visit, and should you ever need it, there is plenty of information on this site about wood working bed plan. information on wood working band saw then drop by the site above and check it out. Hi paul s, I found your blog informative. While out blog surfing today for specific info on wood working clamps, I ended up on your page. Your site shows that I ended up a little off base, but I am certainly glad I stopped by. I will bookmark your site for a future visit, and should you ever need it, there is plenty of information on this site about wood working clamps. Hi paul s...Wow! While I was searching for info on starting a wood working business I somehow found your page. Obviously I ended up a little off base, but I am certainly glad I stopped by for a read. While I am here, I just wanted to drop a quick note to comment your blog...now to move on and continue my search for starting a wood working business. Should you ever need it, there's lots of information on this site about starting a wood working business.